Every 54,000 miles – replace. Every 60,000 miles – replace. Every 36,000 miles – check & replace if necessary. Every 63,000 miles – replace. Every 18,000 miles – check & replace if necessary. Every 36,000 miles or 4 years – check & replace if necessary. Tensioning tool – Fiat No.1860745100/300. Crankshaft locking tool – Fiat No.1860933000. Camshaft aligning tool (Non-turbo) – Fiat No.1860934000. Camshaft aligning tool (Turbo) – Fiat No.1860931000. Sprocket holding tool – Fiat No.1860831000. Turn crankshaft clockwise to TDC. Ensure timing marks aligned  &  . NOTE: Camshaft timing marks may not align exactly, as sprocket has keyhole slot. Non-turbo:  &  . Turbo:  &  . Remove vacuum pump from rear of cylinder head. Install camshaft aligning tool to rear of cylinder head  . Tool No.1860931000/4000. If necessary: Centralise dowel  by turning bolt  slightly. Remove front cover bolt  . Fit crankshaft locking tool  . Tool No.1860933000. Hold tool in place with bolt  . Hold camshaft sprocket  . Use tool No.1860831000. Slacken bolt  . NOTE: Camshaft sprocket should be able to turn slightly  . 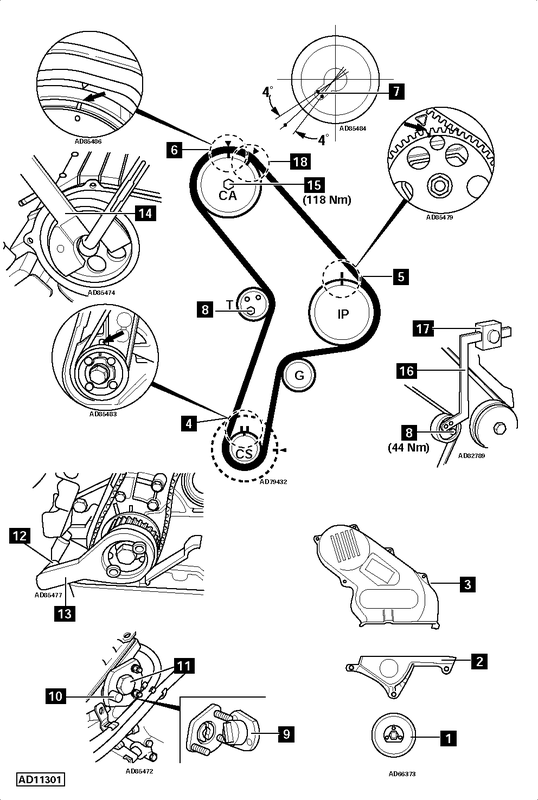 Fit timing belt in anti-clockwise direction. Ensure belt is taut between sprockets on non-tensioned side. Ensure timing mark aligned  . Turn tensioner pulley clockwise. Fit tensioning tool to tensioner pulley  . Tool No.1860745100/300. With scale bar horizontal set weight at 120 mm mark  . NOTE: Ensure scale bar remains horizontal during tensioning procedure. Hold camshaft sprocket  . Use tool No.1860831000. Tighten bolt to 118 Nm  . Camshaft aligning tool  . Tighten bolt  . Tighten tensioner nut to 44 Nm  .